Click Here To View Used Ford Escape Click Here To View New Ford Escape Visit Ford Showroom! The five-passenger Escape is available in S, SE, and Titanium trims, in either front or four-wheel drive. Engine choices start with the 168-hp 2.5-liter four-cylinder. Also, a 173-hp 1.6-liter EcoBoost four-cylinder engine is available. For even more power a 231-hp 2.0-liter EcoBoost four-cylinder engine is offered. All variations are paired with a six-speed select-shift automatic transmission. 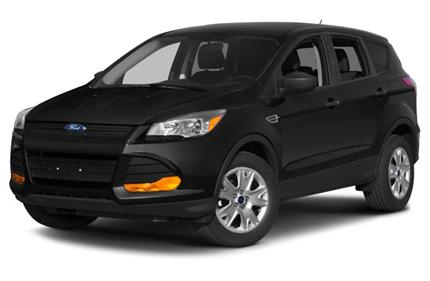 Impressive features offered on the Escape include a Panoramic Vista Roof, satellite radio, SYNC, MyFord Touch, a trailer towing package, heated leather seating, navigation system, auto park with cross traffic alert, Sony audio, MyKey, and an industry first hands-free power liftgate. Standard safety features include seven-airbags with drive knee airbag, passive anti-theft system, AdvanceTrac stability control with anti-rollover technology, four-wheel disc brakes, and tire pressure monitoring. The 2014 Ford Escape is now standard with a rear view camera and SYNC on all trims. Source: Chrome Data. 2013 Ford Escape Review: The all-new Ford Escape offers three four-cylinder engines, most notably the 240-hp EcoBoost 2.0-liter four-cylinder twin-turbo EPA-rated at 21/28 mpg with an available sophisticated new AWD system. There's one smooth 6-speed manual automatic transmission for all models. The 1.6-liter EcoBoost is quick, lively and visceral; while the 2.0 feels like a V6. Classy interior, excellent handling, plenty of cargo space with rear seats that fold down with one touch. MyFordTouch and Voice Command remain problematic. An Escape SE model with the 1.6-liter engine is the way we'd go, to get most of the virtues at the lowest price. Sam Moses filed this report after his test drive of the Ford Escape in the Pacific Northwest. Source: Chrome Data. ...the cabin is a quieter, more subdued place to hang out. -- Car and Driver....the Escape interior is fresh and crisply contemporary without trendy excesses. -- MSN Autos. Source: Chrome Data. If you are looking for a New or used Ford Escape in Kingston or anywhere in Eastern Ontario our sales team will be able to satisfy your needs. We always have a great selection of both new and pre-owned Ford Escape SUVs in stock and add to our inventories daily. At Petrie Ford we are proud to be selling and servicing both new and used Ford Escpae SUVs to customers from Kingston, Brockville, Gananoque, Napanee, Belleville, Trenton, Cornwall and throughtout Eastern Ontario and the Ottawa Valley.